The need for a public library in Morganton and Burke County was first mentioned in early area newspapers. An 1878 issue of Carolina Mountaineer stated, “Greetings! We ask permission to open a reading room—a library of 1500 well-selected classics.” The November 1878 issue of The Blue Ridge Blade noted that The Blade would continue to help Morganton establish a public reading room and circulating library. In the 1880s Laura Powe, as a teenager, read one book at time checked out from a locked closet of the Morganton Post-mistress. The Carolina Mountaineer ran this announcement on April 28, 1883: “New library in Morganton town hall, sponsored by the Morganton Library Association, with Miss Adelaide L. Avery, librarian, and yearly membership of $2.00.” 1905 - Money was being collected for a library in Drexel. 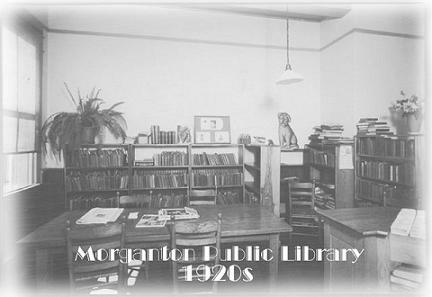 1921 - The Library Extension Department of the Morganton Woman’s Club agitated for a public library and in 1923 opened a one-room library on the second floor at 125 West Union Street.